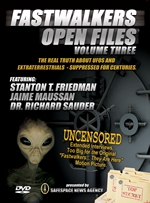 Robert D. Miles, producer of the acclaimed UFO documentary, ‘Fastwalkers’ discusses his 4-volume film series about the UFO phenomenon, featuring 25 experts, including bestselling author, Jim Marrs, Disclosure Project Founder, Dr. Steven Greer, President Eisenhower’s pilot, US Navy Cdr. Graham Bethune, iconoclast physician, Dr. Len Horowitz, the most renowned ufologist in the world, Stanton Friedman, respected Mexican TV producer, Jaime Maussan, underground base expert, Dr. Richard Sauder and Roman Catholic theologian of the Vatican Curia, close friend of Pope John Paul II and long-time exorcist for the Archdiocese of Rome, Monsignor Corrado Balducci. “Fastwalker” is a code word created by NORAD (North American Air Defense Command) to classify unidentified flying objects. It has been reported that from its subterranean facility deep inside Cheyenne Mountain, Colorado the Air Force NORAD facility tracks an average of 500 of these “Fastwalkers” each year.. This entry was posted in Digital Videos. Bookmark the permalink.